RIO DE JANEIRO: Holders Spain sensationally crashed out of the World Cup on Wednesday with a 2-0 defeat to Chile that condemned them to become the fifth champions to fail to get past the first round. On a day when King Juan Carlos tearfully sealed his abdication after a four-decade reign, Spain's players were booted off their throne in 90 minutes after six years as the dominant force of world football. Chile's Eduardo Vargas and Charles Aranguiz administered the killer blows as a trophy-laden Spanish era was brought to a shattering end at the Maracana Stadium. Chile's victory sees them qualify for the last 16 from Group B along with the Netherlands, who thrashed Spain 5-1 in their opening match last week. Australia, beaten 3-2 by the Netherlands earlier Wednesday, join Spain as the other team to be knocked out. In the late Group A game, Cameroon were also eliminated after slumping to a chaotic 4-0 defeat against Croatia, with the Africans finishing in disarray as team-mates scuffled with each other. Yet the drama unfolded at the Maracana, as Spain were swept aside. 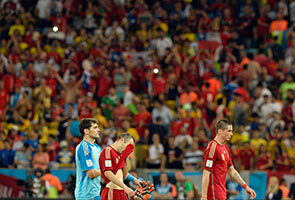 "It is a sad day for all of us," Spain coach Vicente del Bosque said. "We are sorry we didn't succeed (but) now is too early to analyse where we go from here. We were inferior to both Holland and Chile. They got the goals and gave us a mountain to climb." Spain's early departure will send shockwaves through football after an unprecedented period of success that saw them win the 2010 World Cup as well as back-to-back European Championships in 2008 and 2012. "World failure" read an online headline of the El Mundo newspaper in Spain. "Failed!" echoed Spain's biggest-selling sports daily Marca. "A sad farewell to the champions of the world." Spain join Italy (1950 and 2010), Brazil (1966) and France (2002) as the only holders to be knocked out in the first phase. Del Bosque had signalled the turmoil in the Spain camp by dropping veteran midfielder Xavi and defender Gerard Pique beforehand. But Del Bosque's decision to retain out-of-form goalkeeper Iker Casillas backfired, with the Spanish skipper at fault for Chile's second goal, lashed home by Aranguiz just before half-time. Aranguiz had earlier helped to set up Chile's first, cutting back for Vargas to finish after a superb counter-attack. The final whistle sparked delirium inside the Maracana, where Chilean fans had heavily outnumbered their Spanish counterparts and roared on their team relentlessly throughout. The fervour boiled over before the match, with dozens of ticket-less Chilean fans attempting to force their way into the famous stadium by storming the press room. Chile will now face Holland next Monday in what could well be a battle to avoid Brazil, who are expected to face the runners-up from Group B in the last 16. The Dutch had earlier needed goals from Arjen Robben and Robin van Persie to fight back against Australia before Memphis Depay's long-range effort settled a thrilling game at Porto Alegre's Beira-Rio Stadium. Van Persie will miss the next game against Chile though after picking up a second yellow card. And Louis van Gaal's side were given an almighty fright by their fired up Australian opponents, who had taken a 2-1 lead through a spectacular Tim Cahill volley and a Mile Jedinak penalty. Australia coach Ange Postecoglou paid tribute to his team after the loss. "I just wanted the players to get the reward for the way they went about things today," said Postecoglou. Later Wednesday Cameroon joined Spain and Australia on the way out of Brazil after their loss to Croatia. Goals from Ivica Olic, Ivan Perisic and Mario Mandzukic (2) wrapped up the win for Croatia who face Mexico in their final game. Cameroon's campaign ended on a sour note with midfielder Alex Song sent off for punching Mandzukic in the back in the first half. It got worse for Cameroon in the dying minutes with defender Benoit Assou-Ekotto appearing to aim a headbutt at a team-mate before the fracas was broken up.